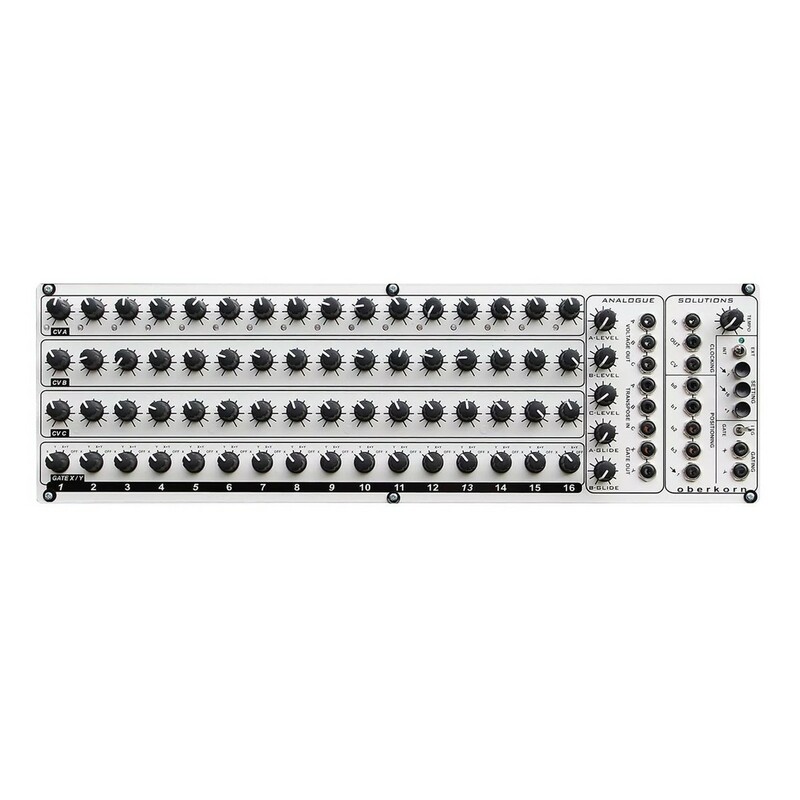 The Analogue Solutions Eurokorn sequencer is a simple but extremely useable solution to control your modular synthesizers. The front panel features a basic 16 step sequencer with 4 controls and a step LED. The four controls at each step comprise the CV control knobs for each of the three channels, plus a three-position switch called Gate X/Y. Eurorack Oberkorn is identical to the stand-alone non-euro version - except it does not have MIDI-Trigger. This is because the MIDI sockets are on the rear of the case. The Eurorack version is modules - it has no rear for MIDI sockets - and, there is no space on the front for any more sockets! It is full! Use our MT9 MIDI-Trigger module if you want a quick and easy way to sync to MIDI. CV control of Speed / Tempo. The Gate output is approximately 10V Positive trigger and designed to work with almost all monosynths with a ?Gate? input. There are rare exceptions. Note: Oberkorn requires +5V in addition to -12V and +12V. On Doepfer cases, 5V is an option. You may wish to purchase this option if you have a Doepfer case. Note to Korg MS20 and Yamaha CS Owners: Korg MS and Yamaha CS series use an inverted gate input. It is possible to custom order a modified Oberkorn with one or both Gate outputs modified to have inverted 5V outputs. This has been tested on an MS20 only.